Everyone knows Willie Nelson. I know this because the other day I saw a billboard advertisement that featured Nelson modeling an upscale line of menswear. Here’s the thing: the only type on the ad was the name of the clothing company. Obviously the advertisers assumed that you’d recognize Willie without any help from them. And why shouldn’t they? In his 80 years on this planet, Nelson has written something like 1,000 songs, recorded more than 100 albums, and won 10 Grammys. “Crazy” was rated the No. 1 jukebox song of all time, according to NPR. Performing professionally since he was a teenager growing up in little Abbott, Texas, he has, he estimates, spent at least half of every year since then either recording or touring, playing nightclubs, honky-tonks, outdoor arenas, concert halls, and every other venue imaginable. Somewhere in there he found the time to appear in more than 20 movies and a handful of television shows. He co-founded Farm Aid, which has raised $43 million to help America’s small farmers hang on to their land, and he sits on the board of the National Organization for the Reform of Marijuana Laws (NORML). He has also written seven books, including an autobiography and a novel, played at the White House, and sung at the wedding of Bill and Melinda Gates (his fee: $1 million). Last year the city of Austin erected a statue in his honor—larger than life, naturally. Somewhere along the line, he ceased being famous as a singer or a songwriter or an activist and simply became famous. You may not care for his songs. You may not give a damn about farmers or marijuana. But the chances that you live in this country and don’t know Willie Nelson are somewhere between slim and none. Like Louis Armstrong—and almost no one else, really—he is a musician whose appeal transcends genre, race, age, or fashion, a stranger to no one, and if you had to put a face on American music, that face would be Willie Nelson’s.At this point it gets a little trickier. Which Willie Nelson do you know? Is it Willie, the “good timing man” who has graced thousands of stages? The “outlaw” who along with Johnny Cash and Waylon Jennings taught Nashville how to reach a new generation of young listeners more comfortable with long hair and jeans than Nudie suits and beehive hairdos? Or is it the avuncular apostle of pot? The farmers’ friend or the proponent of biodiesel fuel? Animal-rights and LGBT advocate? Or the man so honorable that rather than declare bankruptcy he worked to pay off the $16.7 million he owed the IRS in back taxes? Or is it Willie Nelson, the exquisite vocal stylist who can navigate from honky-tonk weepers to the intricate verbal acrobatics of a Rodgers and Hart ballad without missing a beat (he may toy with the beat, sing behind it, ahead of it, or take it halfway to Mars, but he never misses). Or is it Willie Nelson, the peerless songwriter who once wrote “Crazy,” “Night Life,” and “Funny How Time Slips Away” all in one road trip from Texas to Tennessee? Like Walt Whitman, Willie Nelson contains multitudes. All those questions flooded my mind on a recent autumn evening as I was ushered onto Nelson’s tour bus outside the Capitol Theater in Port Chester, New York, where Nelson and the Family, his band, were set to play later that night. I’ve listened to him since a friend played me a record called Red Headed Stranger in 1975. I know probably an album’s worth of his songs by heart, and I’ve had his voice inside my head for so long that it has become an old friend. Despite all that, I realized while waiting for that bus door to wheeze open that I really had no idea who I was about to meet. I didn’t even know what to call him. “Mr. Nelson” seemed too formal somehow, and just “Willie” too presumptuous. In the end I went with “Willie” on the shaky grounds that even one-sided friendships have their prerogatives. The stocky man who stands to greet me in the bus’s kitchen certainly looks familiar: black jeans, T-shirt, and sneakers, and the once-red hair now gone to silver but still long enough to make two chest-length braids. And there is no mistaking that piercing pair of dark brown eyes that know more than they will ever tell, or the still-boyish drawl that has purred out of countless jukeboxes, record players, car radios, and concert halls and is now asking if I want some coffee.We sit facing each other in a small but comfortable booth. A laptop lies on the table between us, and behind his head is a bulletin board covered in photographs of children and grandchildren. Up close, the famous face looks like a well-creased map of rough country, and the unwavering gaze appears less intimidating and maybe even secretly amused, as though to say, there’s nothing you can ask me that I haven’t been asked a dozen times or more, but let’s do this anyway. I begin by asking if music was an inevitable path for him. “I think so,” he says after a moment of silence. “My parents, grandparents were all musicians. I think there’s something in the DNA.” His parents split up when he was a small boy, and Willie and his sister, Bobbie, who plays piano in his band, were raised by their grandparents, who both taught music and ran the choir at the Methodist church (among other jobs—Willie’s grandfather was also the town’s blacksmith, and Willie grew up picking cotton to help the family out). The Nelsons were poor, but music mattered to them, even in the depths of the Depression: there was a piano in the house for Bobbie, and Willie got a Stella guitar when he was 6 years old. What’s the weirdest place you ever played, I ask him. “I don’t know,” he says, looking genuinely puzzled. “I don’t know what weird is.”WHEN WILLIE was a teenager, there wasn’t much difference between the people in the audience and the musicians on the bandstand, many of whom had taken to music as the fastest way out of the cotton patch. “And you were probably going with a waitress in the beer joint,” he chuckles. The thing is, you could hear that shared experience in the songs and the voices that sang them. It’s a sound, Willie agreed, that’s been mostly scrubbed out of modern country.With the instincts of a true gentleman, he politely declined all invitations to criticize what passes for country on most radio stations these days (“I don’t get a chance to listen to local radio a lot, so I don’t know what they’re playing”). But now that SiriusXM radio has given him his own channel, Willie’s Roadhouse, we have a very good idea of what he thinks a country music station should sound like, which turns out to be more Hank Williams and Lefty Frizzell but not too many of the modern “hat acts.” Even contemporary artists sound traditional on the Roadhouse. “I like to think that on our channel we play all kinds of music, and one way or another we pull it together,” he says. “We play a little Vern Gosdin, a little Dolly, then we’ll do some Ray Benson and Asleep at the Wheel, some Merle Haggard, Texas swing. We pretty well cover it. It may not be for every ear, but nothing is.”Nor would he be inveigled into carping about the Nashville establishment. Later, on stage, he’d sing “Me &amp; Paul,” his autobiographical song about road life with his longtime drummer Paul English that hilariously and somewhat bitterly encapsulates his odd-man-out status with the country establishment back in the ’60s (“Nashville was the roughest”). But in the privacy of his bus, he is downright diplomatic when the subject comes up. “Nashville was a different town back then,” he says. “It’s changed a lot now. A lot of people are thinking more progressive now. 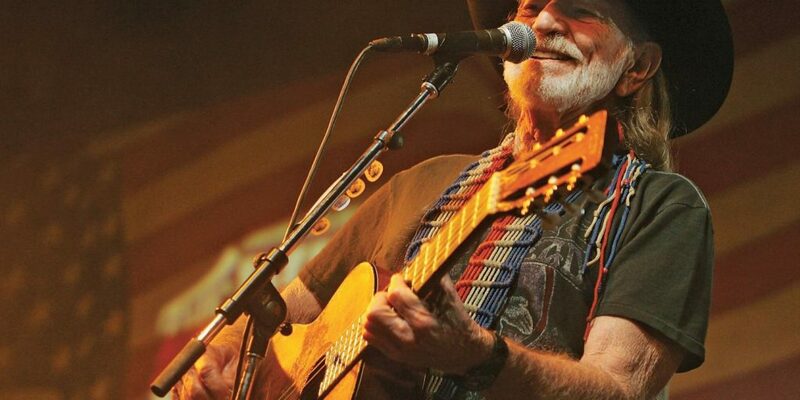 It’s all coming together, so it’s all good.”WILLIE NEVER made it in Nashville as a singer. But as a songwriter he became a superstar. He had spent the ’50s bumming around, playing Texas honky-tonks and taking the occasional deejay job (and selling encyclopedias and vacuum cleaners door-to-door). But ever since he cobbled together his first book of songs at age 12 (with a hand-drawn cover adorned in cursive script resembling a cowboy’s lariat), he has been dead serious about songwriting. He had his first big success in 1960 when Claude Gray had a hit with “Family Bible,” a good but rather pious song by Willie standards that gave no hint of the complex, open-a-vein material that soon followed and made him one of Nashville’s go-to songwriters.Ask him today to name his favorites in his own catalog, and he’ll deflect, as though he doesn’t want to be rude, even to a song: “It’s kinda like kids,” he says. “You can’t hardly separate one from the other. If you took the time to write it, put a melody to it, sing it, record it, whatever, then it’s important.” But when he does relent and starts listing favorites (“Crazy,” “Hello Walls,” “Funny How Time Slips Away,” “Night Life,” “Pretty Paper,” “On the Road Again”), they’re almost all songs made famous by other singers and the songs that cemented his reputation as one of the best writers ever to cross the Nashville city limits. Willie stuck it out in Nashville for most of the ’60s, but the industry never figured out how to sell this man with the dark songs, a reedy tenor, and a jazzman’s sense of phrasing. Yet whenever he became frustrated with his lack of recording success, he would retreat to writing, the one thing that always earned him respect—and generous paychecks. “I felt like Nashville was good to me” as a songwriter, he says. “And for a time I lived up there on my farm at Ridgetop and raised horses and cattle and hogs, just kinda retired for a while and just wrote songs. I enjoyed living in Tennessee. Great place.” The farm gave him perspective, reminding him that there was more to the world than being a star. “I had a guy work for me there, Mr. Hughes. Lived there all his life, there in Goodlettsville, and he had never seen the Grand Ole Opry. He was about 70 years old then, and had never been. He didn’t want to go. So that was a big thing to a lot of people, but to a lot of people there it wasn’t that big a deal. ”No one alive knows more about songwriting than Willie Nelson, but he would be the first to tell you that he can’t explain it. “It’s just a thought process where you hear a good line and you think, well, maybe I’ll take that line and try to write a song. Or it could be a melody that you look for a line to put to it. Works both ways for me.” But either way, it’s a mystery: “You wonder where it comes from.” As for trying to teach someone how to write a song, “I wouldn’t even know where to start.”The distinctive thing about his songs is their deceptively easygoing ability to balance the specific and universal. “Sad Songs and Waltzes” is written from the point of view of a songwriter (“I’m writing a song all about you/a true song as real as my tears/But you’ve no need to fear it/’cause no one will hear it/’cause sad songs and waltzes/aren’t selling this year”). But it doesn’t matter that most of us who hear that tune aren’t songwriters; the sadness at the core of that lyric could pierce the heart of anyone done wrong by love. Sometimes the transaction is more personal. In “It’s Not Supposed to Be That Way,” a frustrated father calls out to a teenager slipping past the bonds of parental control. I first heard the song when my kids were just becoming teens, and what I loved about the lyrics was that no lessons were imparted, just the vivid ache of helplessness that any parent feels at the loss of childhood. The best of Willie’s songs, certainly the ballads, work similar magic, articulating emotions we’ve all felt but couldn’t find the words for. After his Ridgetop farmhouse burned down two days before Christmas in 1970, Willie moved back to Texas. “When I went to Nashville, things were already starting to click in Texas. I was drawing crowds there. And then when I got to Nashville, I kind of got stymied, because I was trying to play for the whole world. So I thought, I’ll just go on back to Texas and play there a while. And it was a good decision.” There would be one more move to Nashville, but by the early ’70s, Willie was ensconced in the Lone Star State, where he encountered an entirely new audience: young longhairs bred on rock and roll and the blues were turning up at his shows, and when Willie helped host the first annual Dripping Springs Reunion music festival in 1972, a precursor of his famous Fourth of July picnic concerts, the audience was equal parts Texas country folks and Woodstock nation, and nobody got beat up.In 1975 he recorded Red Headed Stranger, a concept album conceived and largely written on a road trip from Colorado to Texas (Willie, typically modest, sees nothing in that feat to boast about: “It’s not that unusual, really, because when you start writing, you think of one and then think of another. I wrote a couple of concept albums that way. One song led to another”). The antithesis of the string-drenched countrypolitan sounds emanating from Nashville, the album was so raw, so sparely produced (studio costs: $4,000) that Columbia Records thought he was handing them a demo. That was 25 years ago, and he’s been a constant on everybody’s radar ever since. Thinking again of that clothing ad that for its effect depends on you knowing who Willie Nelson is without being told, I ask him if he ever wished for anonymity, if fame ever got in his way.“Well,” he says slowly, smiling as he fingers one of his braids, “I dress kinda funny for anonymity. But, no, I don’t mind.”So fame is not as corrosive as they say?“I don’t think so,” he says. “I thought that was what we all looked for growing up. Some people when they get it say they don’t want it, but I still like it.“It’s nice to know people are going to come and hear you sing and hear you play. That’s sort of the mystique of the whole thing. People work all day, and then they get in their car and they drive somewhere to go hear somebody sing, and applaud and sing along with ’em. And there’s a therapy there, an exchange, an energy exchange that takes place between the audience and the performer, and it’s pretty magical really, to both the audience and the entertainer.“There was this guy I read about in India who woke up every morning, and he’d run out on the streets and start clapping his hands and running down the street, and everybody’d jump out and join him, and the next thing you know, there’d be hundreds of people running down the road. So they’re putting on their own little concert every morning.” The braided pied piper clearly relates.Repeatedly, when he talks about performing, the concept of serving comes up. “It’s not about me,” he insists. Consequently, he’s careful about espousing causes on stage: “I can promote Farm Aid OK, because I believe in the cause, so it’s not a big stretch for me to do that. But there are probably several things that I wouldn’t want to talk about. And people come for the music. If they want preaching, they’ll go to church.” Maybe so, though many in his audiences would doubtless happily worship at the First Church of Willie: the crowd in Port Chester was nearly all white, but other than that the only common denominator was a fierce addiction among young and old to the music of Willie Nelson—these veterans knew the words to nearly every song.Since the ’70s, Willie has opened nearly every set with his pal Johnny Bush’s classic, “Whiskey River.” “After that, who knows,” he says. Listening to Willie work his way through familiar material like “Angel Flying Too Close to the Ground” and “Good Hearted Woman” in Port Chester, I was struck by the fact that while he must have played and sung these songs thousands of times, he somehow still finds a way to invest them with a freshness and emotional depth that makes you believe that he is playing them for the first time. It’s as if he’s saying, you may have heard this one before, but you haven’t heard it this way yet. And you haven’t.There’s no loafing on a Willie Nelson stage. The Family band that backs him up includes blood kin (sister Bobbie has lately been joined by various Nelson sons and daughters) and performers like English, who has been in the band so long that he might as well be family. But don’t equate family with amateurism. “First of all, they gotta be good musicians,” Nelson says. And to play with Willie, they’d better be. Given his eccentric way with a vocal or guitar solo, anyone who’s not a crack musician would be well and truly lost after half a dozen bars of any song.Over the years, Willie has lost some of the edge on his voice, a diminishment you hardly notice thanks to his impeccable phrasing. But time has only burnished his guitar playing. In the set I heard, he performed a slashing but dexterously lyrical version of the Django Reinhardt instrumental “Nuages.” The gypsy guitar genius has long been an idol for Willie, and if Willie isn’t quite as good as Reinhardt (who is? ), you’d like to think that Reinhardt would nonetheless be touched by the love that came soaring through that song the other night.Willie has been a Reinhardt addict for so long, he can’t remember quite when it started. The peerless Texas fiddler Johnny Gimble “gave me an old Django tape a long time ago. I listened to it, and I realized that this was the music I’d been listening to by other people. My dad played that kind of rhythm guitar, and someone else played that kind of fiddle. And then Bob Wills and all those guys took what Django did and enlarged on it. I had a lot of friends back there who loved Django music, so I got a chance to play it.” Perhaps the most astonishing thing about Reinhardt’s virtuosity was that he managed with only two working fingers on his fretting hand (he lost the use of the other fingers when he was badly burned in a fire). So when someone in the Little Willies, Norah Jones’s country band, called Willie “Django with one finger,” Willie was over the moon. “That was the best compliment I ever had,” he says with a huge grin. The most important words in that last sentence are “down the highway.” How apt that Huckleberry Finn is Willie’s favorite novel, for like Twain’s hero, he can never shake the urge to “light out for the territory,” in Willie’s case, just about every day. “You know that commercial that’s out right now that says a body in motion tends to stay in motion and a body at rest tends to stay at rest? That’s very true. Very true.” Bearing in mind that Huck is a fictional character and Willie is flesh and blood, is it too much to suggest that both embody what we want in our heroes—the uniquely American home brew of guts, youthful spirit, wiliness, honesty, freewheeling humor, and no taste at all for cant or hypocrisy?What keeps Willie more earthbound—but makes him, if anything, more admirable—is the unpoetic fact that he’s responsible for the 40-some people on his payroll, including a road crew of 22. If he doesn’t work, they don’t get paid. “I think about that,” he says. “That’s one of the reasons I’m probably still here. And that’s good. I need another reason.” Leave it to Willie to fashion a blessing out of obligation. Willie says he quit drinking and smoking sometime between age 30 and 35. “I had a pack of Chesterfields, and I was smoking pot and cigarettes, and my lungs were killing me, and I said, well, I ain’t getting high on these goddam cigarettes. So I took the cigarettes and threw ’em away and rolled about 20 fat joints and stuck ’em in the pack. When I wanted a cigarette, I lit a joint. And I haven’t smoked since. Very good way to quit. Cigarettes and alcohol killed a whole bunch of friends of mine.”Pressing my luck, and hoping he won’t think that I’ve come just to write his obituary, I ask if there was ever a point at which he confronted his own mortality and pondered what he had left to do.He pauses before answering that one. “I don’t know that there’s ever one moment or one second when I did that,” he says. “Or maybe there’s not a second when I’m not thinking about it. I’m always thinking about the next record or show, but mainly for my own entertainment. But, yeah, there are things I haven’t done. I’m really looking forward to this duet album coming out. After that I’ll figure out what the next one will be. Might be an album of new songs that I’ve written. I’ve got a few stacked up over there. And I’ll be going to Nashville in a couple of weeks to do some more recording, and when I get enough done of my own original stuff, I might put it out.“I don’t really think about … I know some day I’ll move on. Everybody does. But I don’t worry about it. I like where I am now. Everything’s fine. And there’s nothing I can do about anything that’s happened. The only thing I have any control over is what’s happening right now. So I don’t worry about a while ago or after a while.”Night has fallen while we’ve been talking. Now it’s time for him to go to work. This entry was posted on Friday, August 3rd, 2018 at 8:04 pm and is filed under Magazines. You can follow any responses to this entry through the RSS 2.0 feed. You can leave a response, or trackback from your own site.